When I visited a magnificent James Means designed home last fall, in preparation for writing up the home profiles for the Cathedral Tour of Homes, I was quite taken with the cork floors that were in the laundry room. I had never seen cork floors, and I thought they were unique and beautiful. The owners of the home selected them for their antibacterial quality, their ‘green’ character, and the softness and sound dampening quality that they provide. When looking into a floor for the craft room, I kept thinking about cork. It is a flooring surface that has been used for over 100 years, and is considered very green because it does not require the cork tree to be cut; cork is the outer material of the tree. The quiet and soft feel of the cork, with its sound dampening qualities, is perfect for the space. Cork has a consistent and springy texture, a great middle ground for a space that will partially be used for crafts, partially for playing. The cork has a natural shock absorbing quality, which means that vibrations and noise will be absorbed effectively. Cork is naturally moisture, mold, and insect repellant, and does not off gas. Although cork is more expensive than other flooring options, I found a reasonable source at a local flooring retailer, and a full color spectrum including a lighter option that will work perfectly in the space. According to the sales rep, cork has a very good ‘memory’ and wears very well – as well as hardwood floors. One cork floor supplier that I found online has a wide variety of colors, and the cork tiles come in a variety of shapes and sizes, allowing for many design possibilities. Source: www.corkfloor.com. Alas, I am on a strict budget (and this is a simple space), so I am looking at standard 12”x36” planks. Given that cork can be cut in an infinite variety of shapes, there are many interesting patterns seen on the internet. Cork tiles in a diamond pattern. It seems that the pattern options are unlimited! Another cork floor using contrasting colors and shapes. Cork planks in a casual dining area – the size and shape of these planks resemble a wood floor. A cork floor pictured in a loft like art studio. Many cork plank or tile products already have a protective sealer on them, but additional layers of a sealer can be added to protect the cork or give the floor different levels of sheen. Light colored cork used in an exercise room. A designer friend of mine said that he recently installed cork as the flooring in the basement of a beautiful home he just worked on, and said it looks and feels wonderful. There are quite a few pictures of cork floors in kitchens, interestingly enough. The shock absorbing quality of cork apparently makes it a very comfortable surface to stand on for long stretches of time. I am leaning towards getting a light bleached looking cork for the space (I prefer it over the standard honey brown). Details are being worked on today – no final decisions have been made. Cork definitely has a more contemporary look than other floor options, but since this room is on its own, I am intrigued with the thought of using it – it won’t define the decor of the home, after all, like the floors in the public areas of the house. I would be very interested to hear any comments or feedback on those of you who have ever installed or experienced a cork floor. I have a cork floor in my family room. It was installed in the late 50's and is still in perfect condition. When we moved into this house I was sure we'd remove it asap but we really like it, and since there's nothing wrong with it we decided to keep it. Cork floors really are wonderful. We put them in our kitchen, and I'm so glad we did. I tend to bake in long marathon sessions, and it's been such a great surface to stand on. They'd be a great surface for your craft room. I highly recommend them. I never posted my kitchen on my blog(bad blogger, I know,) but here's a link to a partial kitchen reveal over on the GardenWeb Kitchen forum. 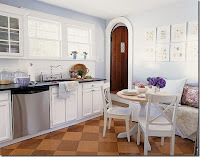 Beekeeperswife also used cork floors, and her kitchen is simply gorgeous! Love all these pics of cork floors! Thanks for sharing. I love, love cork floors. They're so practical! We use to have it in our old house at my kids' playroom and it was fantastic. super easy to clean and to keep it clean, so comfortable and beautiful. I wouldn't use it all over the house as wooden floor, because it can feel too much, but I think it's great to certain rooms. We had a cork floor installed in our basement about seven or eight years ago. We loved the look and feel. However, two years later we had a leak in the basement, and the floor was pretty much ruined. Water got into the seams of the slabs and, when it all dried out, the slabs shrank and now there are bumpy gaps. We've lived with the damage but are now going to pull it all up and just have the concrete. We would use cork flooring in a craft room, however, would use a simple pattern and one color. The light bleached would be our pick as well. Holly I have not tried them however the descriptions sound wonderful, and I love the spectrum of colors! We just built our house last year and built it fairly green (EarthCraft Gold, geo-thermal heat and a/c, dual flush, etc.). We installed cork throughout the basement and LOVE it. It is so comfortable. It has such nice "give" and I feel like it warms up the basement tremendously. I found that it was cheaper than hardwoods (more expensive than carpet). I hope we don't have the flooding problem your other commenter had, but if we did, it would probably ruin just about any flooring. My husband and I have both said that if we ever built another house, we would consider cork throughout. We have hardwoods on the main and 2nd floor and our feet just feel so much happier when we're down in the basement! I had a cork floor in my old kitchen and LOVED it. We floated ours over asbestos tiles we couldn't remove except at great expense. Ours was dark gray and looked great with white cabinets and a pale gray countertop. I love cork. We put it in our bathroom 16 years ago and have now put it in every bathroom we redo. My grandparents had it in their bathrooms in their very beautiful old house so to me it doesn't feel modern when used in a bathroom or laundry room. I finished my attic, and put laminate floors. This is where the kids play the Wii, and I regret those floors every day - it is SO loud! I wish I knew about cork. Cork would have been the perfect solution! It was great reading this post and being informed of yet another wonderful green opinion. I personally have never used cork or know of anyone who has but I'm intrigued. I can't wait to see your finished room and floor. Look like leaky rooms are a bad place but I love this: "With a little common sense and regular light cleaning, your floor should outlast the one in Chicago’s First Congregational Church – and it’s been in use since 1890!" Frank Lloyd Wright famously used cork flooring in all of his kitchens -and less famously my grandparents had cork in their kitchen since they built the house in 1950 and it never needed to be replaced! We installed cork flooring in our upstairs masterbedroom after ripping out carpeting. Only regret is not having done so sooner! It is heavenly. Warm in winter, cool in summer...very temperate. It seems somewhat sound proof as well. The washed ivory color throws a lot of people and most can't believe its cork. I wish I had more rooms to install in. Go forward with confidence and don't look back, you will love it. Great post Holly, thank you! I'm interested in this for our basement, but how do you clean it?! I've seen cork used in a wine room, music room, kitchen, even a restaurant in San Fran. I think it would be perfect in your craft room. Great post on a wonderful material! Loved catching up on your prior posts! Thank you for this post! This is giving me an idea for my exercise room and the playroom for our new build. I never even thought of cork until I saw your post! I'm off to research!! I think a cork floor in your craft room would be perfect! You will have to let us know what shade you end up with. I am going to put cork in my kitchen, hallway and laundry room but am a little concerned about the wet areas and cork. I read somewhere that you should use glue down tiles vs floating cork planks in a kitchen area (or is it the opposite?). Also a flooring vendor advised putting several coats of urethane over the finished floor (even though it's prefinished???). Thoughts or comments? It's going to be beautiful but functional too! I'm pretty sure that President Eisenhower had a cork floor in his Oval Office at the White House.